A couple of days ago I felt there wasn’t a good material on would, be used to, be used to used to and get used to that would meet all the requirements for my student. And so I decidecd to make up something myself. I needed smth that would let us briefly refresh and revisit the knowledge, rather than dwell on it for a long time. And something that encouraged speaking rather than filling in the gaps. Very often such materials are based on stories, but somehow all those stories didn’t seem good enough for my student (an open-minded young male working for an IT giant). So I decided to try a substitution table. 2) then to think how each of those sentences (completely different and not connected) could be continued/ what could be the context for each sentence. So this still gives your students a chance to work with stories, but in a different, more personalised and creative way. If you teach a group of students, they could probably think of thier own continuations, then compare them and choose the best ones. 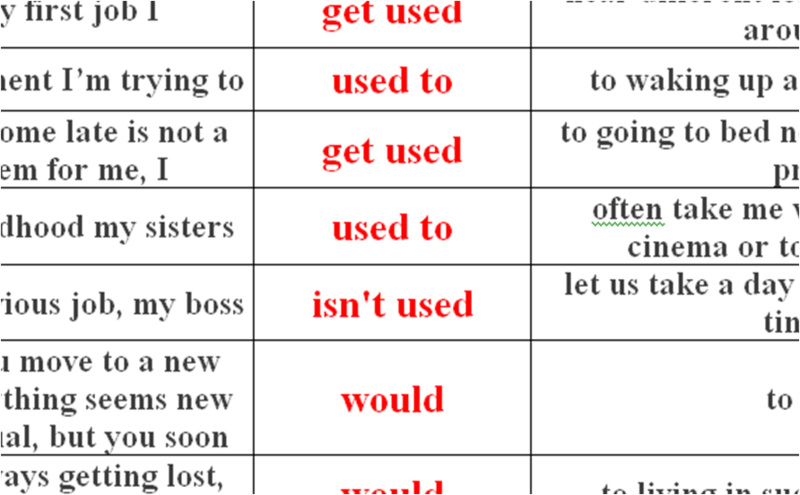 If you’d like to make your lesson more kinaesthetic-friendly ))), especially in groups, you can cut out some of the squares and let your students put them back to recreate the sentences. This entry was posted in Uncategorized and tagged ELT, English as a second or foreign language, lesson plan, lesson starter, speaking, substitution table, used to, warmer, would. Bookmark the permalink.